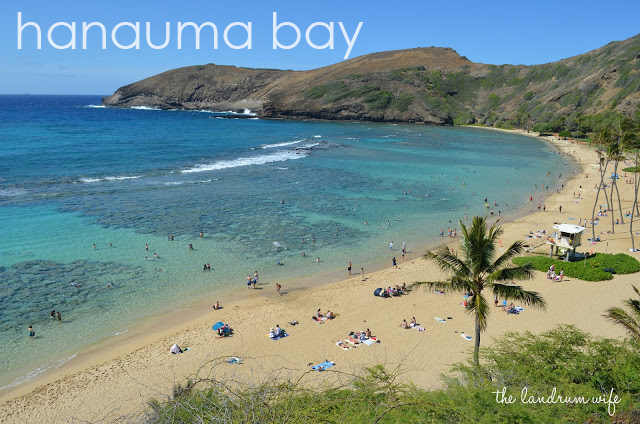 The entrance fee is $7.50 per person; kama'aina (residents) and military as well as children 12 and under are able to get in for free. There is also a $1 parking fee that can be reimbursed if you leave within 15 minutes of arriving. Pets and alcohol are not allowed within the park, and feeding the fish is illegal. There are lockers available to store your items at what I believe is $7 for the day -- we haven't used them yet so I'm not 100% positive. Snorkel gear is also available for rent. Restrooms are located at both the bottom of the hill and the top near the gift shop. I would definitely suggest arriving early -- on this day, we watched the sunrise at Lanikai Beach and headed here to snorkel, so we were at the beach by about 8AM. You won't have to deal with so many people or worry about actually being able to find parking in the limited space lot. I highly recommend an underwater camera -- you can go back later and identify the types of fish you were able to spot if you are a marine life novice like I am! Please, please do your best to not step on the coral when you are out snorkeling! Not only can it be harmful to you (you don't want coral growing in a cut!) but it also damages this delicately beautiful environment. 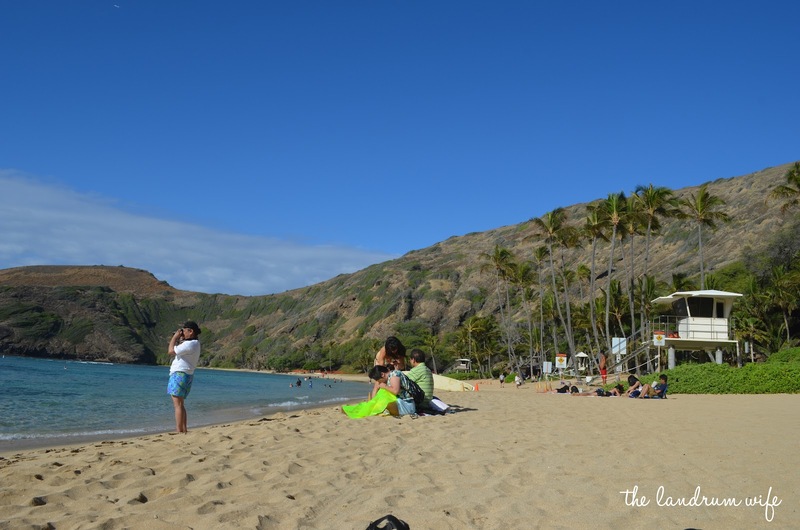 Hanauma Bay Beach Park is a gorgeous stretch of golden sand and incredibly clear water that just happens to have some of the best (if not THE best) snorkeling on the island of Oahu. Hanauma is a nature preserve, and the park takes the preservation of the different species of coral, fish, and other creatures that live, eat, and swim in this spectacular setting incredibly seriously. Before you can enter the park for the first time, you must undergo an orientation of sorts, where a park official briefs you on what exactly a preserve is and then shows an informative video on how Hanauma and other notable sights (in particular Koko Head) were actually created in Oahu's past. After the orientation, which lasts around 20 minutes, you are then free to proceed down the stretch of road to the beach itself. (If you plan on coming back within the year, be sure to sign your name on one of the clipboards after the movie). It's pretty steep to the bottom, but there is a tram that will take you and your gear up ($1.00 per person) or down ($0.25 per person) the road if you so desire. As you walk or ride down, you are able to see this incredibly inviting curved bay beckoning you to come swim and explore. Our friends, Shawn and Tay, searching for fishies! 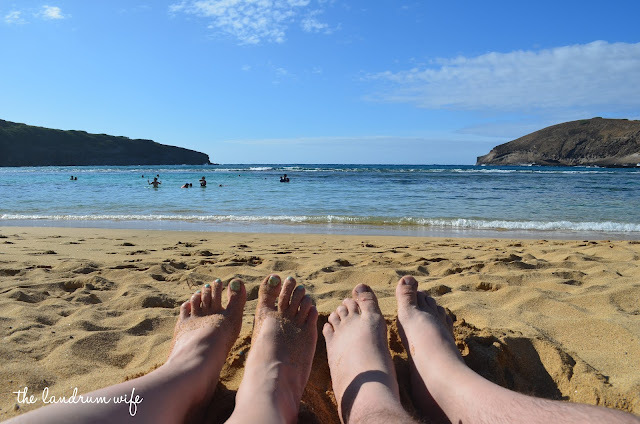 Mr. L, our friends, and I spent a couple of hours lying on the beach, swimming, and snorkeling around the bay. It was an absolutely amazing experience, and the only way we could have had a better time was to stay longer and spend the day here! One thing I'm very excited about is something that I read about in a guide book a friend gifted me titled Oahu Revealed: The Ultimate Guide to Honolulu, Waikiki, & Beyond, which is a FABULOUS in-depth guide to all Oahu has to offer (I loved it so much I've already bought the Big Island edition and plan on purchasing the Maui one as well). 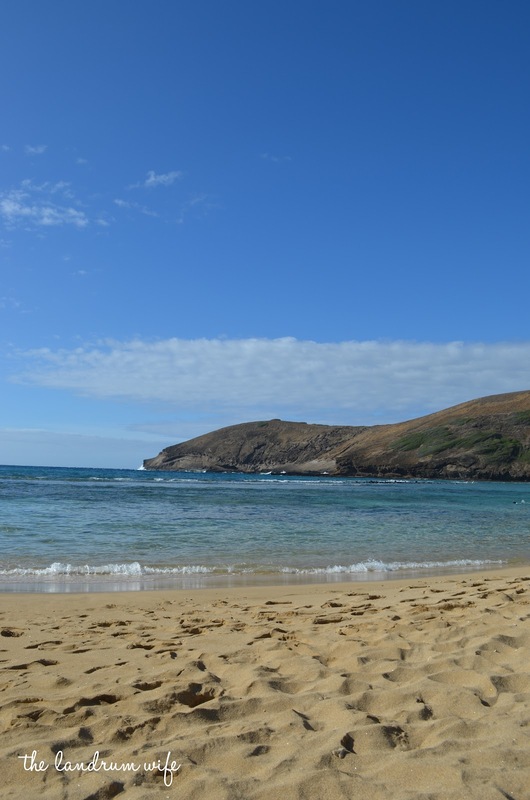 When talking about Hanauma, the guide book mentions the opportunity to do a nighttime snorkel. 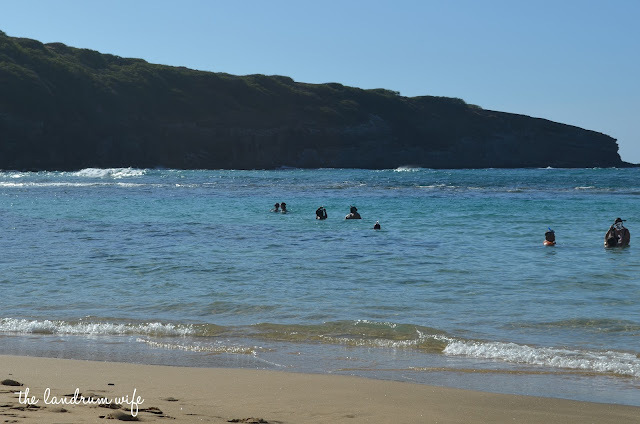 On the 2nd and 4th Saturdays of the month, the park actually stays open until 10PM, giving snorkelers the opportunity to don their gear and underwater flashlights and see a side of the bay not normally seen by many visitors. I can't wait until Mr. L and I get the opportunity to not only try that, but come back during the day as well to discover all of the beauty Hanauma Bay has to offer! i was so gonna write a post about the bay today...hahah glad i didnt!! I love it there, one of my favorite places!!! Haha, you should have! I'm sure there's lots of things that I ended up missing, especially since I haven't been there that much! Love it there! 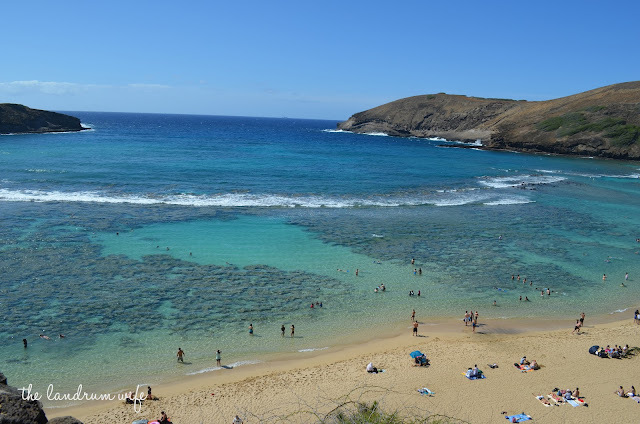 One of my favorite places to snorkel but only if we get there early and it isn't crazy busy! 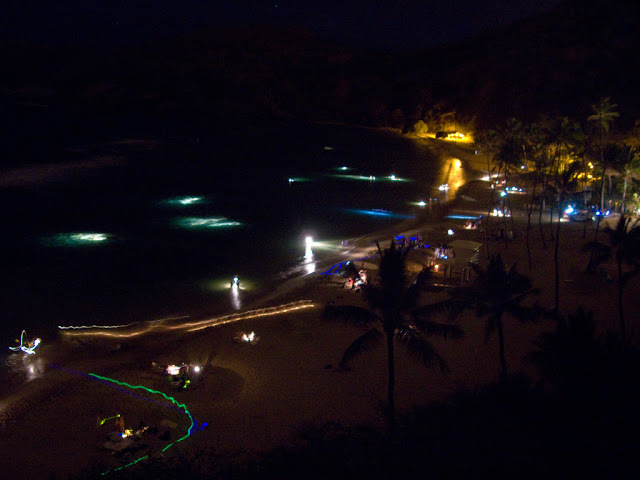 I read that in Oahu Revealed to, I am dying to do the nighttime snorkel!